The sixteenth edition of the Millennium Cup started on Sunday 17 April when the five tennis clubs in Streatham began their campaigns to win the trophy in 2016. By the end of July, Grafton and Norbury Park emerged as this year’s finalists, and by September, Grafton, who hosted the final, hoisted the trophy for a third time. Click HERE for a report on the Final. 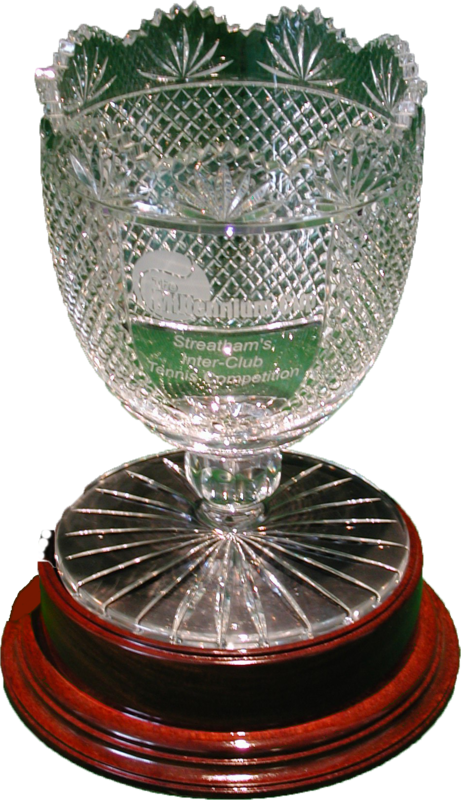 The Millennium Cup is a unique competition that provides friendly match play across all age groups over the summer. In order to keep the standard equitable, the Committee agrees with each club to exclude specific team players, making for as level a playing field as possible. The Organising Committee met on 8 March to conduct the draw. Defending champions Telford Park won the competition for the sixth time in the 15-year history of the competition in 2015, defeating Grafton 8-1 at Grafton. The trophy has been won four times by Wigmore, while Grafton and Norbury Park have each won it twice. In 2013, Woodfield Grove‘s name was added to the honour roll of champion clubs engraved on the silver sleeve. Woodfield Grove also won the special Millennium Cup Masters event staged in 2015 to celebrate the 15th Anniversary of the competition. This year promises to be yet another fun-filled final for those involved when Grafton hosts Norbury Park over the weekend of 17/18 September.